'Our concern for the young, a compassionate heart for those who suffer, and belief in the gift of our spirituality is widely shared.' Fr Brian McCoy SJ reports back from the recent meeting of the Major Superiors of JCAP in Japan. I have recently returned from Japan where there was a gathering of the Major Superiors of our Asia-Pacific Conference (JCAP). We were there to discern in common the various reports from our Conference, with recommendations of new Universal Apostolic Preferences (UAPs) for the Society over the coming decade. This process had been initiated by Fr General, who invited the Society of Jesus to pray, reflect and consider UAPs for the whole Society. 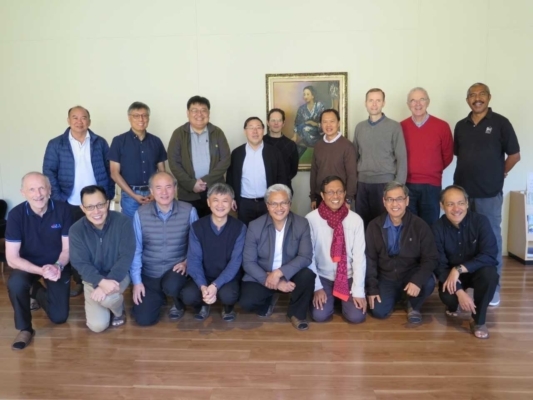 In Australia, and as our part of the process, we held Jesuit community, regional and formation meetings leading to our own Extended Consult in July and our Australian report. While each of the 15 reports from the provinces, regions and missions of JCAP reflected much of the diversity of the culture, religion and struggles of Asia Pacific, some key issues were identified. We recognised the needs of youth, the marginalised and the importance of our Ignatian spirituality. We also considered the constant need for personal, communal and institutional conversion, the ‘China factor’, the relationship between men and women, the impact of the digital world and the increasing fragmentation and polarisation of our world. We realised we are a minima compañía, sinful and small in numbers, facing the great challenges and brokenness of our world. Over three days we met, prayed and shared in spiritual conversation. We were led by a team involving our own Michael Smith from Jesuit Refugee Service in Rome. We came up with some final recommendations that will now go to Rome. The next step of this discernment process will involve Fr General and his Extended Consult in January 2019. They will discern the recommendations from across the whole Society. Then, Fr General will take the result of that process, and his own recommendations, to Pope Francis, for confirmation and blessing, but also to be mandated by him. Hopefully, we will receive them in early 2019 and before our Jesuit Assembly and Province Gathering at Easter! I found the process helpful for a number of reasons. We were asked to firstly look back at earlier UAPs and reflect on how our Provinces had engaged them. Clearly, there were mixed experiences; some within our communities had even forgotten what they were. It reminded me, in our own process of developing an apostolic plan for our Province, that whatever final priorities we give to our mission we need to build in ways to monitor and review fidelity to our priorities. I also came away from Japan realising that while, at times, we can feel quite out of touch in JCAP with our own particular culture, colonial history and western influence, we also share much in common with our neighbours. Our concern for the young, a compassionate heart for those who suffer, and belief in the gift of our spirituality is widely shared. We continue to move forward. May the Spirit continue to guide and give us hope.